Exclusive, limited circulation report, signed and numbered. 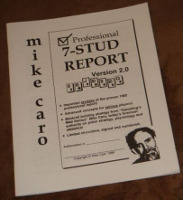 Packed with analysis and advice that serious seven-card stud players and professionals need. Focuses on detailed tactics and explanations about which starting hands to play and how to get the most profit from them. Also includes powerful general seven-card stud concepts, statistics, and advice for the fourth, fifth, sixth, and final (river) cards. Recommended primarily for serious players and students.